We made the decision here at Kinsta to move our entire infrastructure to Google Cloud Platform early 2016, making us the first managed WordPress host to exclusively utilize the platform. By doing this we could ensure a high-level of redundancy and have granular control over our servers while also having the ability to tweak our hosting environment; making customers’ sites faster, more stable, secure and completely isolated. Google Cloud Platform not only allowed us access to one of the largest networks in the world, but also ensures customers have less downtime as we can now utilize live migrations of virtual machines. Today we want to dive deeper into some of the advantages of using Google Cloud Hosting for your business. SADA Systems recently surveyed 200+ IT managers about their use of public cloud services, and found that 84% of IT managers surveyed are using public cloud infrastructure today, as opposed to corporate data centers. “All signs point to public cloud adoption growing and enterprise IT becoming more comfortable with the prospect of running their most sensitive data on public cloud infrastructure,” says Tony Safoian, president and CEO at SADA Systems. Even Cisco is now forecasting that by 2020, cloud traffic will represent 92 percent of all data center network traffic. 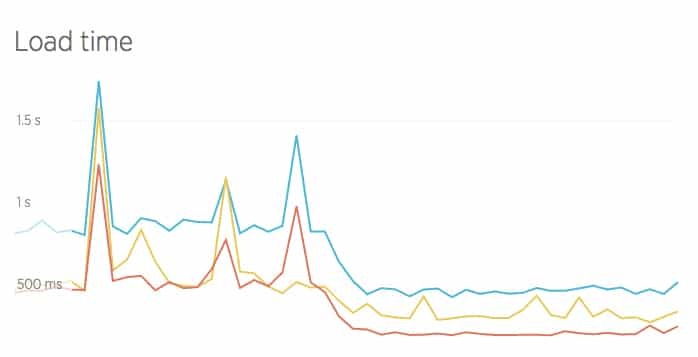 According to Google Trends (seen below), interest surrounding Google Cloud Platform itself has been on a very rapid rise over the past couple years. More and more companies are migrating because in most cases it offers the most secure, flexible, and cost-effective solution. It saves money on IT staffing and allows for almost instant scaling of any online platform or solution. Google Cloud Hosting, and or Compute Engine, is just one of many services provided by Google Cloud Platform. They also offer their App Engine, storage, DNS, CDN, and a multitude of other services and products. Google Cloud Platform consists of a set of physical servers, as well as virtual resources like virtual machines (VMs) that are contained in Google’s data centers around the globe. We use Google Cloud Platform’s multi-regional deployment mode. This means that you can choose a different data center for each of your WordPress websites. Some notable companies that are using Google Cloud Platform (Compute Engine or App Engine) include Spotify, HSBC, Home Depot, Snapchat, HTC, Best Buy, Philips, Coca Cola, Domino’s, Feedly, ShareThis, Sony Music, and Ubisoft. Even Apple has been seen moving some of its services away from AWS, spending between $400 million and $600 million on Google Cloud Platform; although this couldn’t be independently confirmed. eBay is also now exporting 1B+ items in their live catalog to Google Cloud Platform. 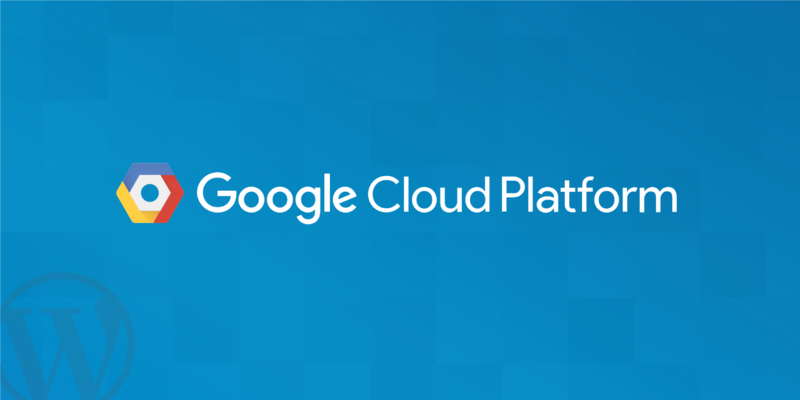 See a full list of case studies and companies utilizing different services on Google Cloud Platform. Even Apple uses Google Cloud Platform for data storage for its iCloud services. And most recently, GitLab and Twitter moved to Google Cloud. Now let’s take a look at some of the top advantages to using Google Cloud Hosting and why we think it is currently the best solution on the market as it pertains to pricing, performance, stability, scalability, backups, and security. Google bills in minute-level increments (with a 10-minute minimum charge), so you only pay for the compute time you use. And a big bonus is that they give you discounted prices for long-running workloads with no up-front commitment required. Use the VMs for a month and you get a discount, as simple as that. This makes it perfect for startups and for enterprise IT to cut costs. AWS for example requires prepays in the form of “reserved instances” to be eligible for the discounts. And Azure only offers a 5% discount on a 12-month prepay. 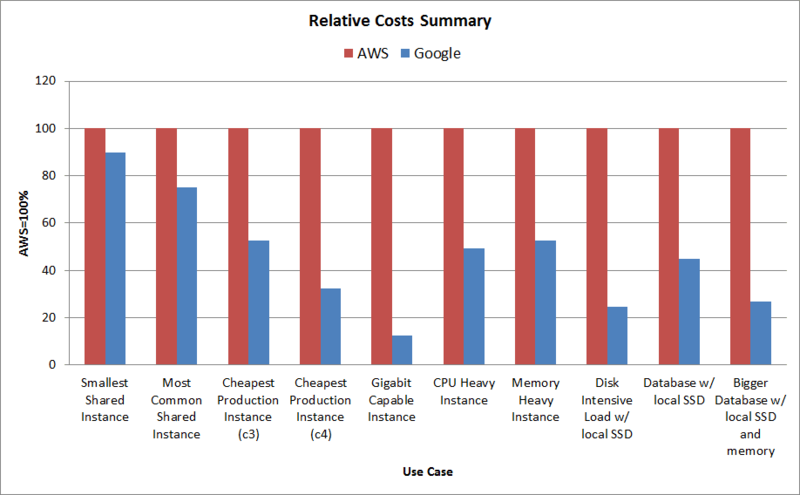 Sandeep Dinesh did a good comparison recently of just how cheap Google Cloud’s SSDs are when it comes to performance vs price and a comparison against AWS and Azure. To start off, instances are simply lower in cost on Google Cloud Platform, Compute Engine alone is typically between 40% – 50% cheaper than AWS and Azure. 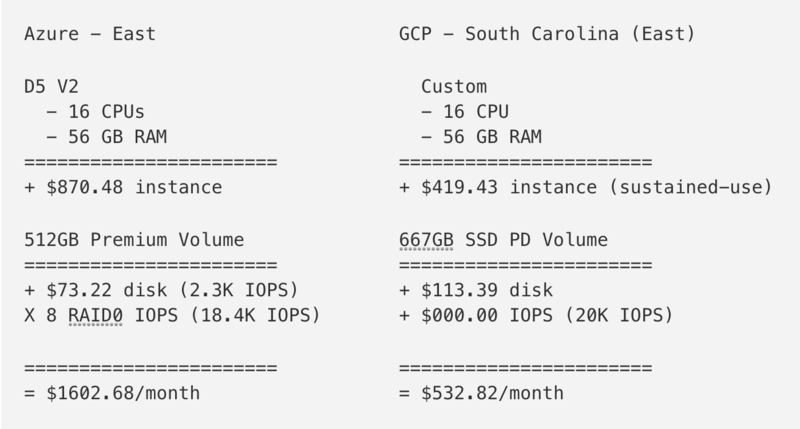 When it comes to Google Cloud Platform you basically get more IOPS for less than 1/3 of the cost. 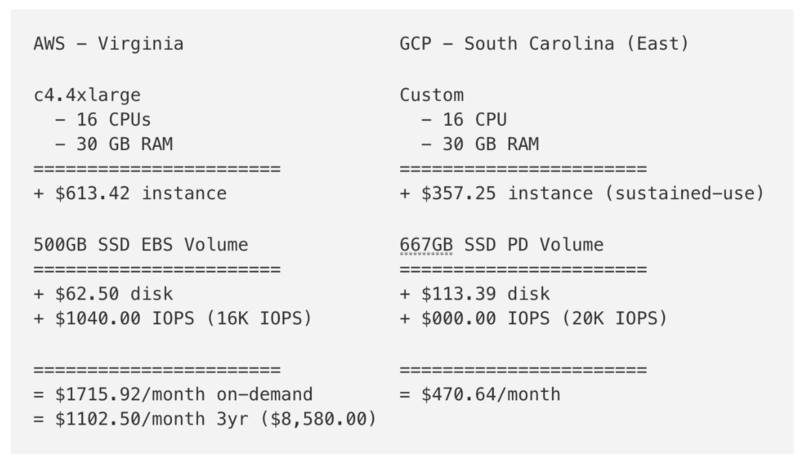 As you can see with this configuration below with AWS you are looking at $1,102.50/month with 3 year contract as opposed to Google Cloud’s $470.64/month. IOPS is a measurement for input/output operations per second and how often a device can perform IO tasks. In most cases, the great number of IOPS, the better the performance. When it comes to Azure it is slightly different. As Sandeep points out, you have to attach premium SSD storage to get the same persistent network attached storage. But again, once you do a comparison between the two it is again about 1/3 of the cost to use Google Cloud Platform. As you can see with this configuration below with Azure you are looking at $1,602.68/month as opposed to Google Cloud’s $532.82/month. In November 2016, AWS reduced their prices. The HFT Guy, a developer from London, then wrote about how he stacked up Google Cloud vs AWS and discovered that Google Cloud was still 50% cheaper (after the price reduction)! He stated, that all Google instances have significantly faster network than the equivalent [and even bigger] AWS instances, to the point where they’re not even playing in the same league. AWS might have kickstarted the cloud generation, but Google Cloud is the one taking it over. Cloud Spectator, a cloud performance benchmark company, also did an in-depth price-performance analysis in 2017 of North American providers. 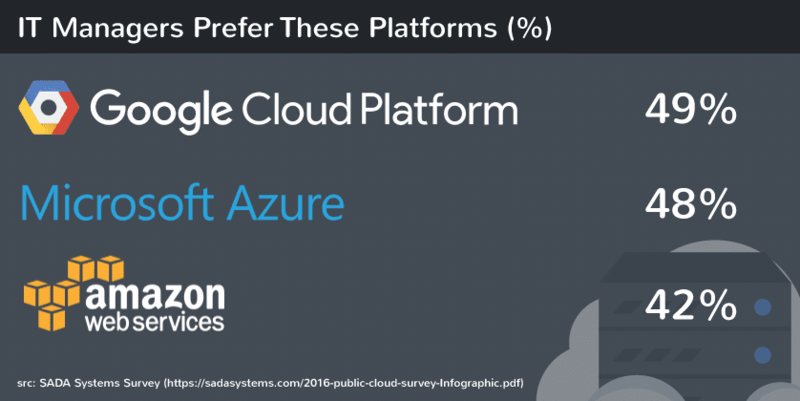 This report included Google Cloud Platform, Amazon, Azure, and SoftLayer. 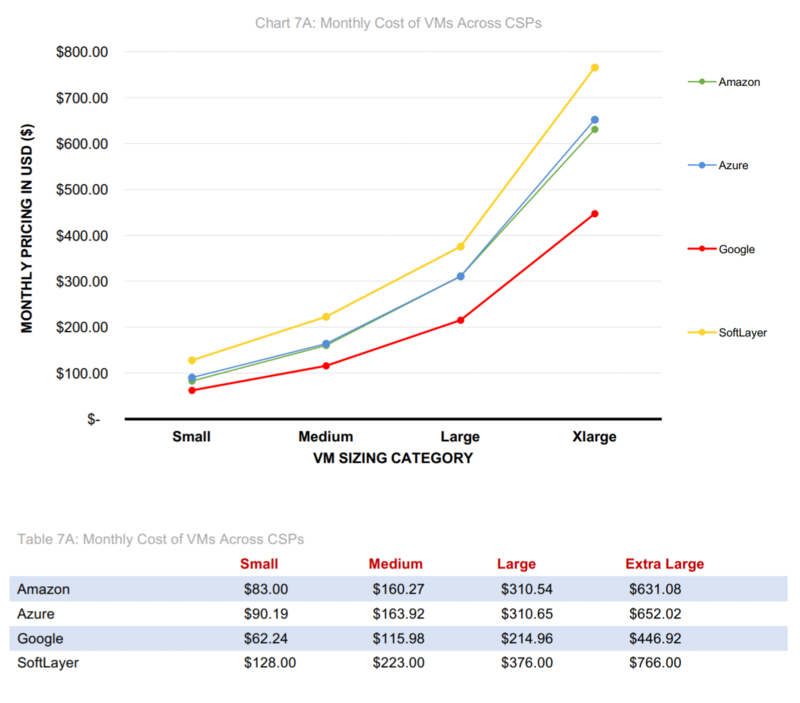 They discovered that across the board, from small VMs to extra large VMs, Google Cloud was the least expensive. Make sure to check out their study for more details on configurations and tests. 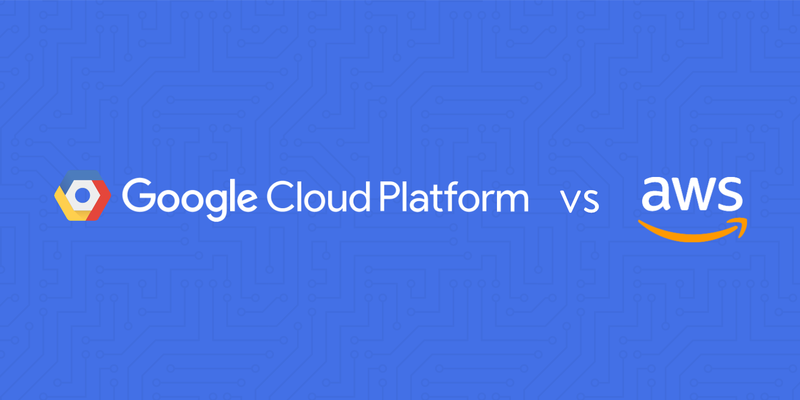 Here is another great in-depth price comparison over a longer period of time from Quizlet, who chose to migrate to Google Cloud Platform in 2015. And as of August 2017, Google Cloud Platform announced a price cut on their storage costs. Local solid-state disks (SSDs) attached to on-demand Google Compute Engine virtual machines are now up to 63% cheaper. In the US, that is around $0.080 per GB per month. The same goes for SSDs with Preemptible VM instances, which are now up to 71% cheaper. On June 29, 2016, Google announced their investment in the FASTER Cable System which gives Google access to up to 10Tbps (Terabits per second) of the cable’s total 60Tbps bandwidth between the US and Japan. They are using this for Google Cloud and Google App customers. The 9,000km trans-Pacific cable is the highest-capacity undersea cable ever built and lands in Oregon in the United States and two landing points in Japan. Google is also one of six members which has sole access to a pair of 100Gb/s x 100 wavelengths optical transmission strands between Oregon and Japan. 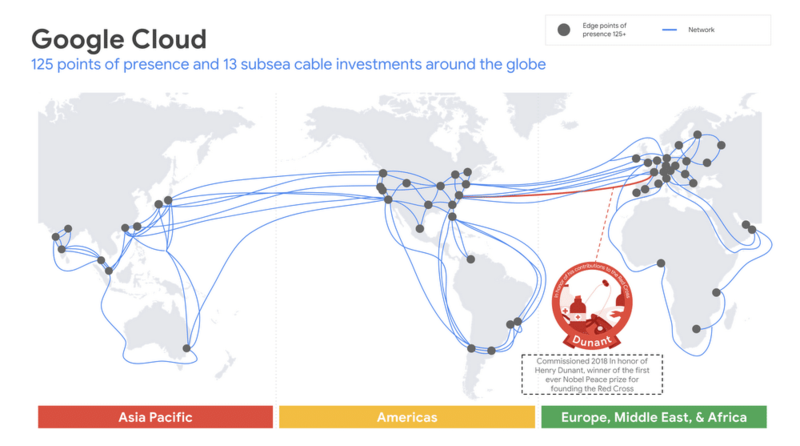 On July 17, 2018, Google announced their first private trans-Atlantic subsea cable, also known as “Dunant.” This cable crosses the Atlantic Ocean from Virginia Beach in the U.S. to the French Atlantic coast and is expected to become available in late 2020. You probably get the picture here. How many other providers do you know that are laying their own fiber optic cables under the ocean? And the great thing is that the network speed also helps make a difference in total cost. With the speed, comes the ability to process more data in less time. By having such a large infrastructure and network, this allows them to give us those cheaper computing prices as shown earlier. 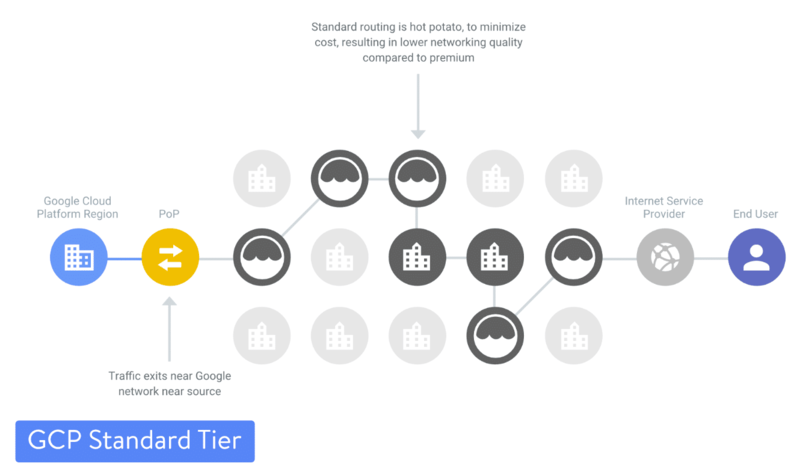 And not only that but as of August 2017, Google Cloud Platform launched their separate premium tier and standard tier networks. This makes them the first major public cloud to offer a tiered cloud network. The premium tier delivers traffic over Google’s well-provisioned, low latency, highly reliable global network. Redundancy is key, and that’s why there are at least three independent paths (N+2 redundancy) between any two locations on the Google network, helping ensure that traffic continues to flow between the locations even in the event of a disruption. The standard tier delivers network quality comparable to that of other major public clouds. It delivers outbound traffic from GCP to the internet over transit (ISP) networks instead of Google’s network. 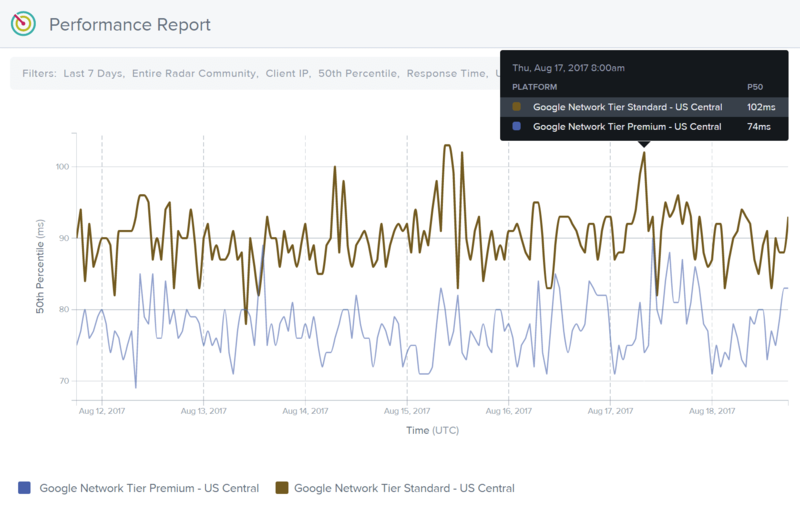 Here is a measurement from Cedexis of the difference in latency on Google Cloud Platform’s premium tier vs the standard tier in the United States. 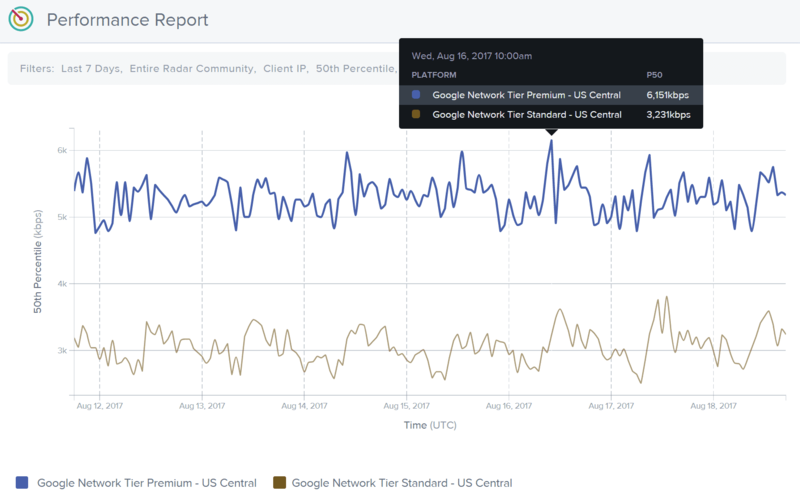 Here is a measurement from Cedexis of the difference in throughput on Google Cloud Platform’s premium tier vs the standard tier in the United States. Kinsta utilizes Google Cloud Platform’s premium tier for all of our clients to ensure lightning-fast load times by minimizing traceroute hops and decreasing the distance the data has to travel. Another huge advantage for Google Cloud Hosting, especially for how we use it here at Kinsta is live migrations of Virtual Machines. Neither AWS, Azure, or smaller providers like Digital Ocean offer this functionality. So this is a very important differentiator for Google Cloud compared to other cloud providers. As a WordPress hosting provider, this means we are basically always up with our VMs, with no noticeable degradation in performance when they are live migrating VMs between host machines. Benefits of live migrations allow for the engineers at Google to better address issues such as patching, repairing, and updating the software and hardware, without the need for you to worry about machine reboots. Miche Baker-Harvey, Tech Lead/Manager at Google put together a great illustration of the high-level steps involved in a live VM migration. And besides live migration of virtual machines, Google also offers resizing of persistent disks without any downtime. You can use the portal or CLI to actually resize the live disk. 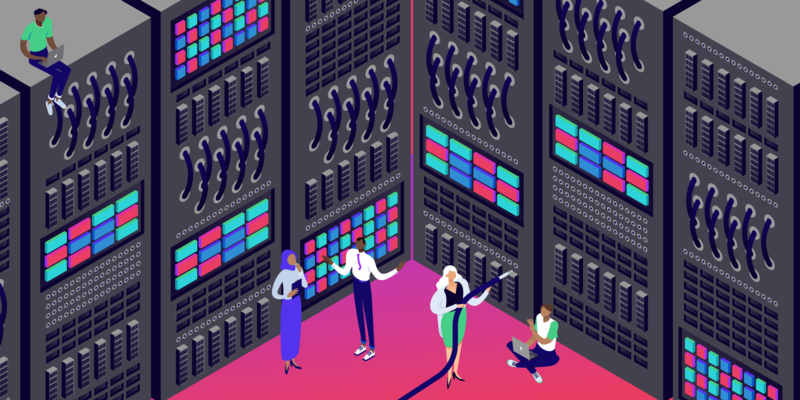 Kinsta was just recently named top tier once again in Review Signal’s annual 2018 WordPress hosting performance benchmarks. And a lot of this is thanks to Google Cloud Platform. We were the first managed WordPress host to exclusively utilize Google Cloud and are the only enterprise level host using them. And we would like to think that the results speak for themselves. Kevin at Review Signal threw a whopping 10,000 concurrent users against our servers and as he noted for the Load Storm test, Kinsta had basically flawless performance with flat average response times, minimal errors and no spikes. And some of our clients get a lot of traffic. We have seen the Google Cloud machines easily handle 60k+ concurrent visitors without any hiccups. Here is an example below of load times significantly decreasing on a client’s site after we moved them to Google Cloud Platform. Before the move they were getting spikes well over the 1 second range, and after they stayed consistently under 500 ms. So just by migrating them to Google Cloud Platform they saw a 50% decrease in load times! Their VMs definitely do a good job of handling whatever you throw at them. Also, because we use Google Compute Engine servers, this ensures automatic scalability. Instead of being constrained to 2-6 CPUs per VPS as with other WordPress hosting providers we actually let the site’s container scale to as many CPUs as needed when there’s a surge, and for load balanced clients an infinite number of CPUs as our system dynamically spins up more machines and scales back when the traffic wave subsides. 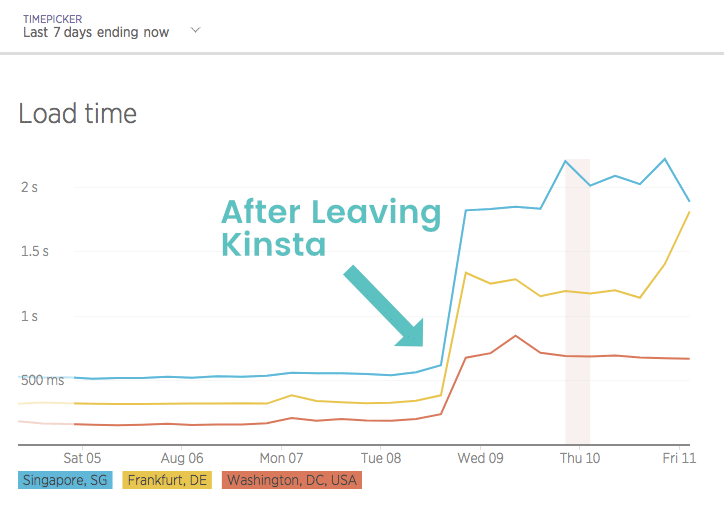 Here is another example of what happened when Neuralab moved to Kinsta’s platform powered by Google Cloud. Their wait time, also known as TTFB, dramatically decreased. And here is an example of a site that migrated away from Kinsta and Google Cloud Platform. They were instantly met with higher load times. In fact, we have had some clients leave and come back because of this. Google Cloud Platform is making leaps and bounds when it comes to making a bigger dent in the cloud computing space. As of January 2017 you can now leverage GPUs for machine learning and scientific computing. And in March 2017 they released VMs with 64 virtual CPUs. Another big advantage is security. Choosing Google Cloud Platform means you get the benefit of a security model that has been built upon over the course of 15 years, and currently secures products and services like Gmail, Search, etc. Google currently employs more than 500 full-time security professionals. Niels Provos, a security Engineer at Google, gave a great in-depth look at the security of Google Cloud Platform (see video below). All data is encrypted in transit between Google, the customers, and data centers; as well as the data in all of the Cloud Platform services. The data stored on persistent disks is encrypted under 256-bit AES and each encryption key is also encrypted with a set of regularly changed master keys. The layers of the Google application and storage stack require that requests coming from other components are authenticated and authorized. Because Google has relationships with some of the biggest ISPs in the world, this helps improve the security of your data in transit as it means less hops across the public internet. You can see more in-depth behind the scenes in Google’s security whitepaper. Kinsta also uses Linux containers (LXC), and LXD to orchestrate them, on top of Google Cloud Platform which enables us to completely isolate not just each account, but each separate WordPress site. This is a much more secure method than offered by other competitors and helps ensure secure WordPress hosting 24×7. Read more about how LXD works in Stéphane Graber’s post on LXD 2.0. All 19 of these Google Cloud Platform locations are available for Kinsta clients when choosing where to strategically place your WordPress site. Google has also stated there will be additional locations announced in 2019. We at Kinsta appreciate Google’s dedication to global expansion as this helps decrease latency across the board and ensures faster load times. Google Cloud Storage is designed for 99.999999999% durability and has 4 different types of storage: Coldline storage, nearline, regional storage, and multi-regional storage. It stores data redundantly, with automatic checksums to ensure data integrity. The beauty of multi-regional storage is that it is also geo-redundant, which means cloud storage stores your data redundantly in at least two regions within the multi-regional location of the bucket. As it pertains to Google Cloud hosting, this ensures you will never lose your data, even in the case of a disaster. As you can see, when it comes to Google Cloud Hosting and utilizing Google Cloud Platform, there are a lot of advantages. Not only is it cheaper, but you also benefit from one of the largest networks in the world! This means less latency and more accurate compute prices as data is able to be processed in less time. Live migration of virtual machines is currently a unique and very important differentiator when it comes to comparing other cloud hosting providers. 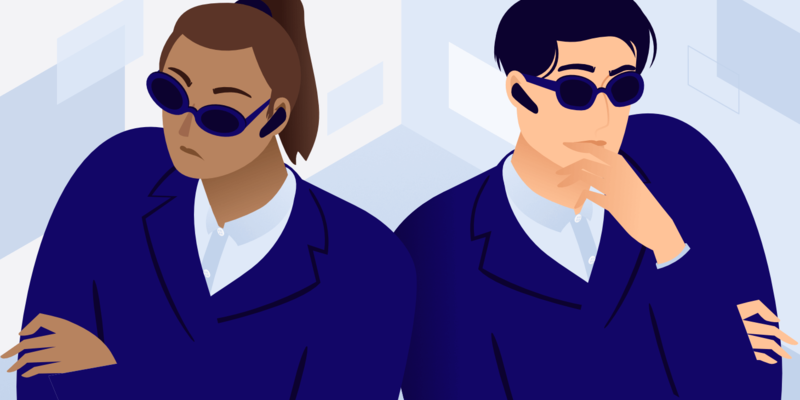 Top it off with state of the art security and performance that is able to handle hundreds of thousands of concurrent connections and you have a platform that can set your business up for long-term success. Have any of your own experiences with Google Cloud Hosting? If so we would love to hear about them below in the comments. Great, glad to hear it! We definitely saw a huge difference when we chose to migrate to GCP. Improved Performance – great results, but if your clients migrated to and from crappy hosting providers then of course you’ll get such dramatic results. How do you stack up against WP Engine? Hey Mark! Great question. In fact, many of our clients come to us from WP Engine because of performance reasons. You can check out our prices here: https://kinsta.com/plans/ If you subscribe to annual plan you can get two months free! Hi Brian, Thanks for the post, I was looking for a cloud hosting for my Magento store, No doubt, In fact, all the written points are concerned with the person who is looking for cloud hosting, selecting Google for hosting is not a bad choice over other hosting companies like Kyup or Vultr. There’s a value of AWS for the cloud that I have studied to another blog, but, Being a Magento owner, I also suggest people choose Google for cloud-like me, I never faced any issue. Security, Backup, Server response rate, load time, Everything is now like a part of high quality website and hosting matters a lot as Google has announced the algorithm for penalizing websites with low site speed. I don’t know, Does Google provide all these features or the hosting company does? Because, I have hosted my Magento store on cloudways and they are providing me all these services, the store is using GCE. Before them, My site loading time was around 11 to 15 seconds, However, after migration. It’s now 2 second or 3 seconds. Does Kinsta have any special features or offers for Magento? So in regards to SSL certs (you can do free Let’s Encrypt certs yourself), auto backups, and caching… these are typically provided by the host. 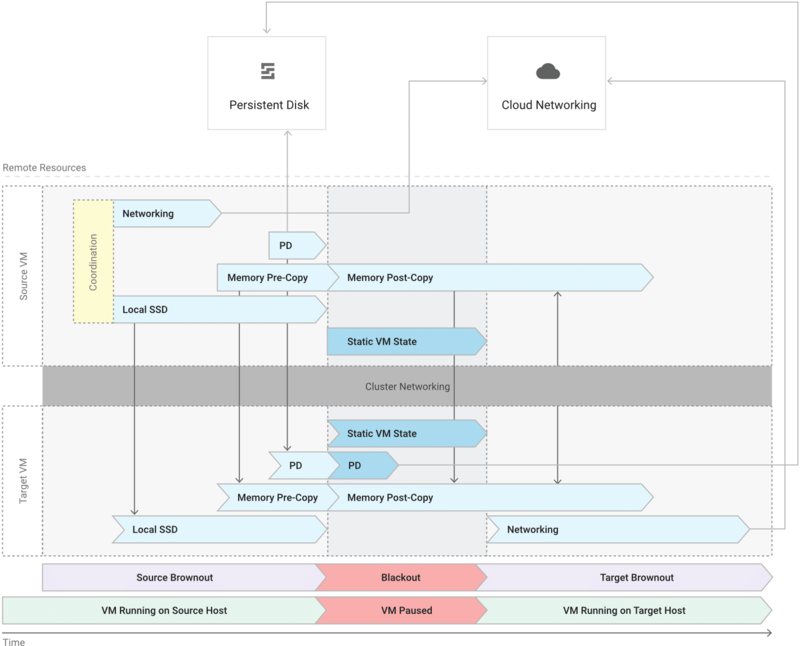 Even the auto-scaling part is typically configured in a way by the host to work correctly, although this is powered by Google Cloud Platform behind the scenes. Unfortunately, we don’t host Magento sites. We only focus on one platform: WordPress. This ensures we are the best in the industry. Those supporting multiple platforms tend to spread themselves thin. This results in subpar support and infrastructures that aren’t as specifically tailored or optimized for your platform. How is the pricing and services when you need to implement FedRAMP due to government support? Does your federal cloud service model have the same advantages as described in this article?